Assignment: Lieutenant Colonel T H Williamson, corps engineers, Provisional Army of Virginia, was appointed chief engineer to Brigadier General P G T Beauregard, Army of the Potomac, by General Orders No.41, Headquarters, Army of the Potomac, Camp Pickens, Manassas Junction, Prince William County, Virginia, on 17 July, 1861. Assignment: Captain W H Stevens, corps engineers, Confederate States Army, was assigned to duty with the First Brigade, Army of the Potomac, under the command of Brigadier General M L Bonham, by Special Orders No.66, Headquarters, Army of the Potomac, Camp Pickens, Manassas Junction, Prince William County, Virginia, on 24 June, 1861. Assignment: Captain D B Harris, corps engineers, Provisional Army of Virginia, was stationed at Camp Henry, C George's, northwest of Culpeper Courthouse, Culpeper County, Virginia, under the command of Brigadier General P St G Cocke, Provisional Army of Virginia, on 20 May, 1861 (See the Fifth Brigade, Army of the Potomac). Assignment: Captain E P Alexander, corps engineers, Confederate States Army, was appointed chief signal officer to Brigadier General P G T Beauregard, Army of the Potomac, by General Orders No.41, Headquarters, Army of the Potomac, Camp Pickens, Manassas Junction, Prince William County, Virginia, on 17 July, 1861. "None of them seem to have done much professional work in the battle but they assisted in posting troops and batteries, a duty for which they were well qualified through knowledge of the tactical value of ground." "Williamson and Harris, who had been there since May, had laid out and built the defenses of Manassas Junction chiefly with slave labour and, presumeably, had also supervised those which were built by Bonham's and Jones' brigades along Bull Run." "In support of the 5th Brigade were five companies of cavalry, the battery of Capt. H Gray Latham, and Capt. Arthur L Roger's Loudoun Artillery, in positions selected by David B Harris, now assigned to Beauregard's staff, while retaining his commission in the Virginia Corps of Engineers." Captain E P Alexander was assigned to duty at Richmond, Henrico County, Virginia, by Special Orders No.80, Paragraph V, Adjutant & Inspectors General's Office, Richmond, Henrico County, Virginia, on 25 June, 1861, dated 2 June, 1861. Baptist College Artillery Barracks, on Bush Hill, south of Deep Run Turnpike, one & a quarter miles northwest of the Capitol, Capitol Hill, Richmond, Henrico County, Virginia 28 June, 1861: Second Lieutenant E P Alexander, United States Corps Engineers, resigned on 1 May, 1861, and was appointed captain, corps engineers, Confederate States Army, on 16 March, 1861, dated 1 May, 1861. Captain E P Alexander, corps engineers, Confederate States Army, arrived at Richmond, Virginia, in the evening on 1 June, 1861, and was assigned to command the artillery at the Baptist College Artillery Barracks, on Bush Hill, south of Deep Run Turnpike, one and a quarter miles northwest of the Capitol, Capitol Hill, Richmond, Henrico County, Virginia, by Special Orders No.205, Paragraph V, Headquarters, Virginia Forces, Richmond, Henrico County, Virginia, on 29 June, 1861, dated 28 June, 1861 (See the 1st Rockbridge Artillery). Note: B Allston was appointed first lieutenant, artillery, Confederate States Army, on 11 June, 1861, and major on 20 June, 1861. Major B Allston, artillery, Confederate States Army, was stationed at the Baptist College Artillery Barracks, on Bush Hill, south of Deep Run Turnpike, one and a quarter miles northwest of the Capitol, Capitol Hill, Richmond, Henrico County, Virginia, between 20 and 28 June, 1861, and was temporarily assigned to the 19th Mississippi Infantry by Special Orders No.76, Paragraph XII, Adjutant & Inspectors General's Office, Richmond, Henrico County, Virginia, on 20 June, 1861 (See the 19th Mississippi Infantry). He appears on the muster roll of the 4th Alabama Infantry, Company F, on 30 June, 1861, and was assigned to command the 4th Alabama Infantry on 11 August, 1861 (See the 4th Alabama Infantry). Richmond, Henrico County, to Manassas Junction, Prince William County, Virginia, 29 June, 1861: Captain E P Alexander was ordered to proceed by the Virginia Central Railroad to Manassas Junction, Prince William County, Virginia, by Special Orders No.84, Paragraph IX, Adjutant & Inspector General's Office, Richmond, Henrico County, Virginia, on 29 June, 1861, and was appointed chief signal officer to Brigadier General P G T Beauregard, Army of the Potomac, by General Orders No.41, Headquarters, Army of the Potomac, Camp Pickens, Manassas Junction, Prince William County, Virginia, on 17 July, 1861. He was stationed at the signal station at Wicoxen's Hill, Prince William County, Virginia, on 21 July, 1861. Captain T H Williamson, Virginia Military Institute, Lexington, Rockbridge County, Virginia, was appointed major, corps engineers, Provisional Army of Virginia, and ordered to Aquia Landing, at the junction of Aquia Creek and Potomac River, Stafford County, Virginia, on 24 April, 1861 (See the 2nd Tennessee Infantry). Note: Major T H Williamson, corps engineers, Provisional Army of Virginia, was assigned to the defense of the Rappahannock and Potomac Rivers between 24 April and 25 May, 1861. Aquia Landing, at the junction of Aquia Creek & Potomac River, Stafford County, to Manassas Junction, Prince William County, Virginia, 25 May, 1861: Major T H Williamson, corps engineers, Provisional Army of Virginia, was ordered to Manassas Junction, Prince William County, Virginia, by Special Orders No.16, Headquarters, Department of Fredericksburg, Fredericksburg, Virginia, on 25 May, 1861, and was appointed lieutenant colonel, corps engineers, Provisional Army of Virginia, on 6 July, 1861. 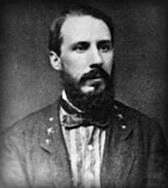 Lieutenant Colonel T H Williamson, corps engineers, Provisional Army of Virginia, was ordered to cut down and thoroughly clear away, all the undergrowth from the forest outside of Camp Pickens, Manassas Junction, Prince William County, Virginia, and for a distance of fifteen yards by Special Orders No.97, Headquarters, Army of the Potomac, Camp Pickens, Manassas Junction, Prince William County, Virginia, on 7 July, 1861 (See the Camp Pickens Garrison). Note: Lieutenant Colonel T H Williamson, corps engineers, Provisional Army of Virginia, was ordered to Manassas Junction, Prince William County, Virginia, by Special Orders No.213, Paragraph X, Headquarters, Virginia Forces, Richmond, Henrico County, Virginia, on 6 July, 1861. First Lieutenant W H Stevens, United States Corps Engineers, resigned on March 2, 1861, and was dismissed on May 2, 1861. He was appointed captain, corps engineers, Confederate States Army, on 28 March, 1861, dated 16 March, 1861. Pensacola, Escambia County, Florida, 27 March, 1861: Captain W H Stevens, corps engineers, Confederate States Army, was ordered to Pensacola, Escambia County, Florida, by Special Orders No.9, Paragraph IV, Adjutant & Inspector General's Office, Montgomery, Montgomery County, Alabama, on 27 March, 1861, and was appointed chief engineer to Brigadier General B Bragg at Pensacola, Escambia County, Florida, on 1 April, 1861. Note: Brigadier General B Bragg, Confederate States Army, was assigned to command the troops in and around Pensacola, Escambia County, Florida, by Special Orders No.1, Paragraph I, Adjutant & Inspector General's Office, Montgomery, Montgomery County, Alabama, on 7 March, 1861. Pensacola, Escambia County, Florida, to Richmond, Henrico County, Virginia, 6 June, 1861: Captain W H Stevens, corps engineers, Confederate States Army, was ordered to Richmond, Henrico County, Virginia, on 6 June, 1861. Richmond, Henrico County, to Manassas Junction, Prince William County, Virginia, 12 June, 1861: Captain W H Stevens, corps engineers, Confederate States Army, was ordered to proceed by the Virginia Central Railroad to Manassas Junction, Prince William County, Virginia, by Special Orders No.70, Paragraph III, Adjutant & Inspector General's Office, Richmond, Henrico County, Virginia, on 12 June, 1861, and was ordered to Leesburg, Loudoun County, Virginia, by Special Orders No.46, Headquarters, Department of Alexandria, Camp Pickens, Manassas Junction, Prince William County, Virginia, on 19 June, 1861. He was assigned to Brigadier General M L Bonham, Confederate States Army, by Special Orders No.66, Headquarters, Army of the Potomac, Camp Pickens, Manassas Junction, Prince William County, Virginia, on 24 June, 1861. D B Harris was appointed captain, corps engineers, Provisional Army of Virginia, on 2 May, 1861. Camp Henry, C George's, northwest of Culpeper Courthouse, Culpeper County, Virginia, 20 May, 1861: Captain D B Harris, corps engineers, Provisional Army of Virginia, was stationed at Camp Henry, C George's, northwest of Culpeper Courthouse, Culpeper Counrty, Virginia, under the command of Brigadier General P St G Cocke, on 20 May, 1861 (See the Fifth Brigade, Army of the Potomac).